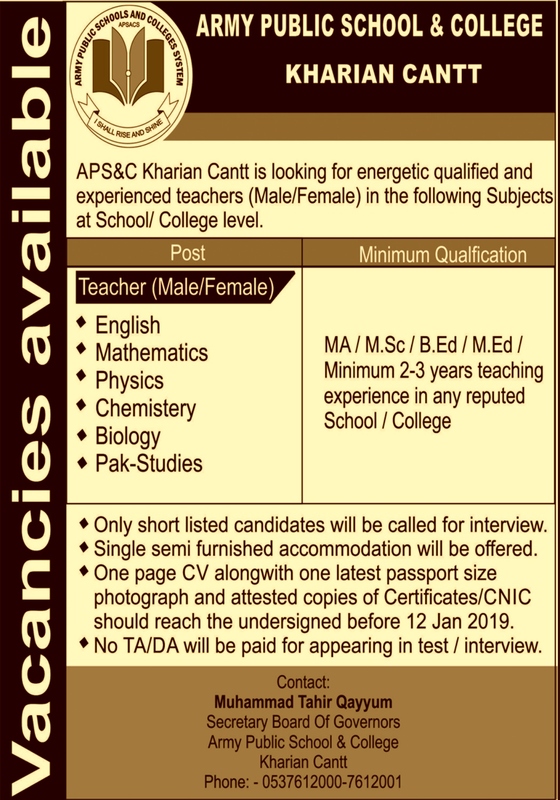 Excellent jobs have been announced at the Army Public School and College Kharian Cantt 2019.Jobs have been announced for teachting at Army Public School and College Kharian Cantt.Your Education Master and M.Sc are required to apply to the Army Public School and College Kharian Cantt .APS&C Kharian teacher (Male/Female) in the following Subjects at school College Level. MA,M.Sc / B.ed /M.Ed and Minimum 2 year teaching Experience. How to Apply For APS Kharian Cantt job? One Page CV alongwith one latest passport size photograph and attested copies of certifictes/ID card should reach the undersinged befor 12 jab 2019.